Hey there, treasure hunters! 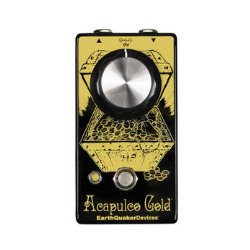 The Acapulco Gold is a dirt-simple distortion Device based on the power section of a cranked vintage Sunn Model T, bringing the openness, clarity, and crunch that only a dimed tube amp can provide, at a fraction of the size, and without expensive maintenance costs! Since tone is in the hands, we decided to keep the controls of the Acapulco Gold as simple as possible. The footswitch turns the pedal on and off, and the giant knob controls the output volume. That's it. The rest is at your fingertips. Want less gain? Turn down your guitar's volume knob. Need a darker rhythm tone? Roll back your guitar's tone control. Easy, right? The Acapulco Gold is all-analog, true bypass, and built one-at-a-time by a wandering expedition of prospectors and speculators in dusty Akron, Ohio, USA – the hamburger capital of the world.